During this tour you will enjoy cultural programmes of various Tripura communities, see marvelous rock carvings, visit famous temples and enjoy a beautiful nature. Day 01: Arrival at Agartala, the capital of Tripura. Transfer to tourist lodge. Overnight in Comilla View Tourist Lodge near the Kamasalagar Lake, 30 km from Agartala. The famous Kasba Kali Bari Temple is situated nearby. Day 02: Sightseeing in Agartala. You will visit Ujjayanta Palace, the State Museum, Fourteen Goddesses temple and the Bhuveneshwari temple. Overnight in Comilla View Tourist Lodge. Day 03: After breakfast departure from Comilla for Bagafa. Today you will visit the Reang community. We take our lunch at Pilak. Tripura has got beautiful rock cut carvings and stone images at Pilak, Unakoti and Debtamur. 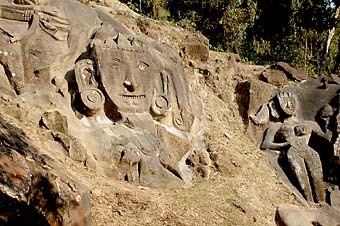 Most of these carvings are huge in size and made on vertical walls exposed in the open atmosphere. Departure from Pilak for Subrom near the Bangladesh border. Overnight in Subrom. 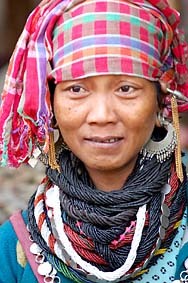 Day 04: In the morning we will drive to Rupaichhari to attend the cultural programme of the Mog- and Tripura community. Lunch at Gumati Yatri Niwas. After lunch we will drive to Udaipur for sightseeing. The town is about 55 km from Agartala. Udaipur is dotted with temples, of which the most famous is the Tripura Sundari temple, which is one of the 51 Shakti Peethas and was constructed by Maharaja Dhanya Manikya in 1501. There is a big lake beside the temple known as Kalyan Sagar. Bhubaneshwari Temple is another famous temple here. Departure from Udaipur for Neermahal Water Palace and overnight at Sagarmahal. Day 05: After breakfast our tour will take us from Sagarmahal to Kumarghat. On the way you will visit the Fourteen Goddesses temple. In Kumarghat you will have the pleasure to attend a cultural programme of the Darlong community. Overnight in Kumarghat. Day 06: This morning we will leave Kumarghat for the Jampui Hills. On the way you will attend the cultural programme of the Chakma community. We will take our lunch at Kachanpur. After that there will be a sightseeing at the Jampui Hills. Overnight at Eden Tourist Lodge. Day 07: Today we will drive to Unakoti, where you will have enough time for sightseeing, because here you can see the biggest bas relief in India. Unakoti is a Shaiba pilgrimage place and dates back to the 7th - 9th century, if not earlier. The marvelous rock carvings and murals with their primitive beauty are not to be missed. Overnight at Kailasahar. Day 08: Departure for Agartala and flight back to Calcutta or Guwahati. In case your holidays have not ended yet, you have the chance to combine this tour with any of our other tours (see suggested tours on top). Or we can arrange an individual extension. Just ask us and together we will arrange a programme that fully suits your interests. 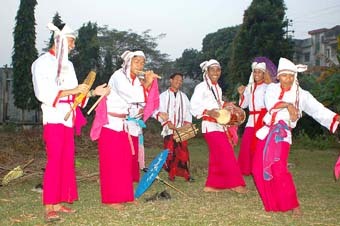 · Local tour and cultural programmes as per itinerary.